Indonesia - Granting communities the right to manage state forests through social forestry programs in Lampung, Indonesia, could have positive outcomes for tenure security and sustainability while reducing land conflicts, a new study has found. The best agency to lead social forestry in the province, the research suggests, is the community-level Forest Management Unit (FMU), with the support of adequate budget, community empowerment efforts and coordination among all actors. Lampung is a pioneer of social forestry in Indonesia, having implemented versions of the scheme for almost two decades. The government scheme grants local communities rights to manage and use forest resources. “Lampung is a province where the implementation of the social forestry program is very advanced in terms of achievement of targets,” says Tuti Herawati, lead author of the study and a researcher with the Center for International Forestry Research (CIFOR). “Forest management reform has not been evenly implemented in all regions in Indonesia. In practice, implementation of tenure reform is faced with key questions such as, ‘What factors affect the security of forest management?’ and ‘How can management rights be guaranteed?’,” she says. To find answers to those questions for Lampung, CIFOR launched a multi-stakeholder consultation using a participatory prospective analysis (PPA) approach. The resulting study addresses how the implementation of tenure reforms in developing countries can effectively improve a community’s certainty of access to forest resources. The research in Lampung is part of the broader Global Comparative Study on Forest Tenure Reform (GCS-Tenure) led by CIFOR in Indonesia, Peru and Uganda, to investigate how forest tenure reforms are implemented, and what the outcomes are for tenure security. 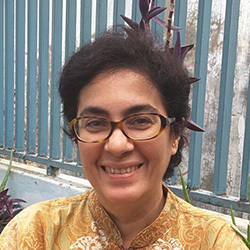 In Indonesia, research is ongoing in Lampung, Kalimantan and Maluku.“We have been collecting data at the community level and among several other actors in Indonesia from 2014 to 2017,” Herawati says. In the past two decades, a number of countries in Africa, Asia and Latin America have given greater recognition to the rights of local communities, indigenous groups and women to manage land and forests. Schemes such as social forestry aim to enhance these rights while providing opportunities for improved welfare and sustainability. Indonesia currently has five social forestry schemes available, namely community forest (HKm, hutan kemasyarakatan), community plantation forest (HTR, hutan tanaman rakyat), village forest (HD, hutan desa), partnership schemes, and customary, or adat, forest. Lampung has tried out all of these schemes, barring customary forest. With almost 20 years of experience in social forestry, Lampung is an ideal place to study the scheme, and uncover data on its impacts on communities. Many external actors, donors and research institutions have worked to support social forestry in Lampung since its initiation, providing a wealth of information. “In one case, a group began working to obtain an HKm license in 1998, and successfully obtained it about five years later through a scheme that was available at the time, while undergoing permit changes in accordance with the dynamics of government policy change. That group’s experience alone can showcase the development of the social forestry program,” Herawati says. Lampung also played a big role in the history of the social forestry movement in Indonesia. In 1998, the Forestry Minister for the first time issued a decree granting a community the right to manage up to 29,000 hectares of forest in the province . “This decree was a huge historical leap. Because previously, concession rights to manage forests were always granted to private companies through timber concessions or plantation rights. But in this case, the Forestry Minister gave the rights to communities around the forest,” Herawati says. Lampung is close to the island of Java, where forest exploitation began in the late 1960s. Government-facilitated transmigration programs followed soon after, along with a natural influx of economic migrants, changing the character of the province. Today, the population of Lampung is dominated by migrant communities from Java. At the community level, social forestry schemes have impacted the tenure security of people living near forests. “Participants in the study reported a significant change of status under the schemes, from originally being considered illegal enroachers to becoming legal participants of social forestry, and no longer feeling afraid of being expelled from the area they have been managing,” Herawati says. The research shows positive impacts from social forestry on the condition of forest resources in Lampung, such as improvements in forest canopy cover, as well as successful rehabilitation and replanting of previously degraded lands. This is partly due to an obligation for social forestry members to plant a minimum of 400 trees per hectare on community forest land. Positive impacts are also demonstrated in local people’s perceptions regarding improvements in household food security and increased incomes after joining social forestry schemes. “In the PPA workshops, we involve all stakeholders in the implementation of social forestry programs, from the regional forestry, agrarian and planning offices, field forestry implementing units, as well as community and farmer groups holding social forestry permits,” Herawati says. The PPA workshops identified six key driving forces that will influence social forestry implementation over the next 10 years in Lampung, including the dynamics of regulations related to social forestry, tenure rights, livelihoods, financial government support, human resource capacity and community awareness. “As a result of PPA activities, there has been good communication between the project team and all PPA participants. We also continue to share information among members of PPA team through mobile group chats, so we can update each other on our activities at any time,” Herawati says. “Once the ideal scenario was selected, we generated an action plan to realize it. At the local government level, there is now an action plan in place to accelerate the strategy of the social forestry program in Lampung until 2025,” she says. The researchers acknowledge the contributions of the PPA expert group in Lampung, representing different stakeholders including government and non-government officials.